The event will take place from 6 pm to 11 pm, with the tour beginning and ending at the Boca Raton Resort & Club, where guests will enjoy champagne and hors-d'oeuvres before embarking on the trolley tour. The trolley stops for this year’s tour include several exciting downtown locations including Union Twenty Seven, Loch Bar, Ouzo Bay, Flamingo House with Prosperity Brewers, Bolay at the Privaira Airport Hangar with Excell Auto Group. 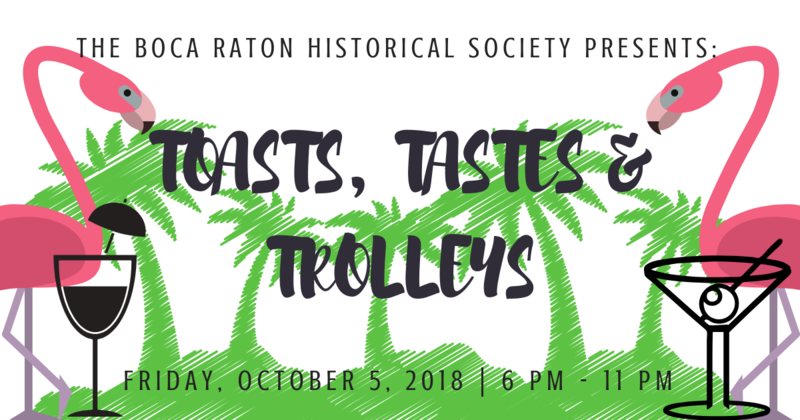 After visiting all of the tour locations, the trolleys will return to the Boca Raton Resort & Club where the evening will conclude with dessert, dancing, and a cash bar. Tickets for this year’s Toasts, Tastes & Trolleys are available with a $125 donation per person. All proceeds from this charitable event will help fund the operations of the Boca Raton Historical Society & Museum. Click here to purchase your tickets online or call 561-395-6766 ext. 101. Tickets to this popular event are limited and tend to go very quickly, so it is highly recommended to make reservations reasonably far in advance. Tropical casual attire is recommended. For more information, please contact the Boca Raton Historical Society & Museum by phone at 561-395-6766 x301 or by email at office@bocahistory.org.